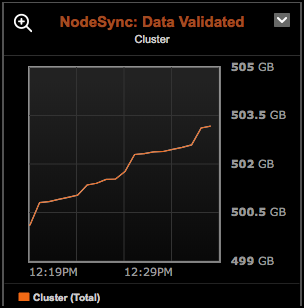 Note: NodeSync metrics are available for DSE versions 6.0 and later. Bytes of data that were inconsistent and needed synchronization. Bytes of data checked for consistency. Total bytes of data transferred between all nodes during synchronization. Number of rows and range tombstones that were inconsistent and needed synchronization. Number of rows and range tombstones checked for consistency. Total number of rows and range tombstones transferred between all nodes during synchronization. Number of pages (internal groupings of data) processed. Number of processed pages that were not in need of synchronization. Number of processed pages that were in need of synchronization. Number of in sync pages for which a response was gotten from only a partial number of replicas. Number of repaired pages for which a response was gotten from only a partial number of replicas. Number of processed pages not having enough responses to perform synchronization. Number of processed pages for which an unknown error prevented proper synchronization completion. After adding metrics and clicking Save Graph, the graphs appear on the monitoring dashboard. Tip: Clone the Default preset tab and give it a name such as NodeSync to organize your dashboard. Alerts are available for NodeSync metrics. 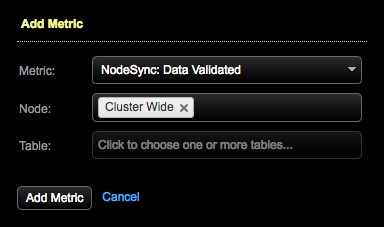 Click Alerts > Notify me when > Advanced > NodeSync > NodeSync metric in the Add Alert dialog. 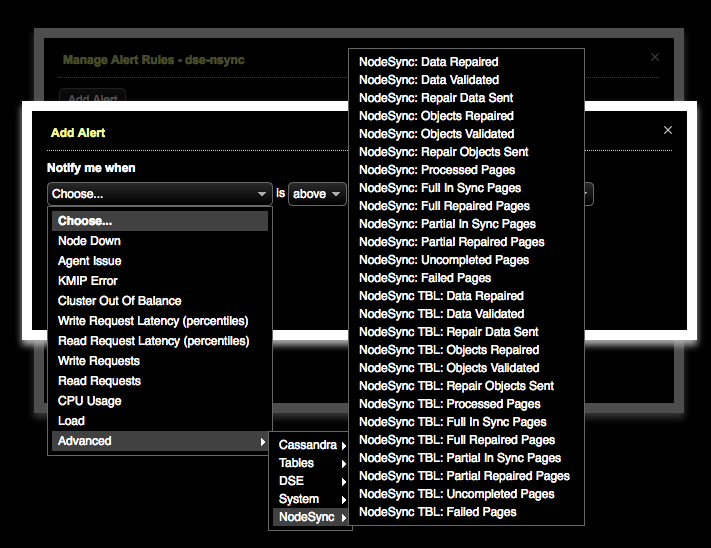 Define the notification criteria for each alert required for monitoring NodeSync in your environment.